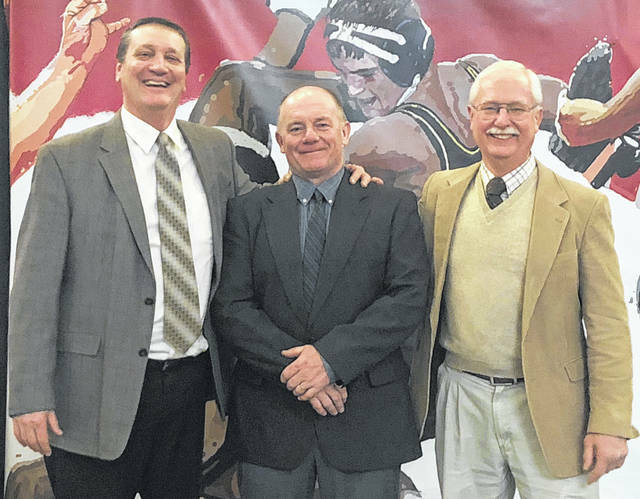 Robert Haynes (middle) was inducted into the Ohio Wrestling Officials Hall Of Fame during the annual OHSAA State Wrestling Championships held at the Schottenstein Center at The Ohio State University Saturday, March 9, 2019. Standing with Haynes are Dan Roberts (friend and Haynes’ presenter to the Hall Of Fame) and Bob Mowrey (friend and Haynes’ high school wrestling coach). Robert Haynes was inducted into the Ohio Wrestling Officials Hall Of Fame On Saturday, March 9, 2019 at a ceremony held at The Ohio State University’s Schottenstein Center. Prior to the OHSAA State Wrestling Finals, Haynes and three others were presented with a plaque to memorialize their induction in front of 13,000 wrestling fans. Joining Haynes were Frederick Feeney of Dublin, Jack Kruse of Johnstown and Tom Evans of Cuyahoga Heights. Haynes, a 1982 graduate of Miami Trace High School, competed for the Panthers on the mat, winning league and District titles his senior season. He qualified to the State Wrestling Championships at 132 pounds. Prior to officiating, Haynes coached at the junior high and high school levels winning SCOL and Sectional titles as an assistant. As an official, Haynes officiated for 25 years refereeing extensively at dual meets and tournaments. He was selected to officiate at league, Sectional and District Tournaments as well as two OHSAA State Wrestling Championships. He was the lead official at the McDonald’s/Miami Trace Invitational for nearly 20 years.. His knowledge of the sport and presence on the mat making difficult calls helped him become a highly-sought official throughout south central and southeast Ohio. Continually working to improve his officiating skills, Haynes was always seeking the input of peers, coaches and tournament directors on his performance on the mat as an official. Haynes is the son of Eleanor Haynes and the late, Robert Haynes. He is married to Lisa Haynes. They have three children and four grandchildren. He is a farrier by trade shoeing standardbred horses at the Fayette County Fairgrounds.